Arizona from Art Gallery plus some pretty Kona Cotton colors plus quilt design in EQ7 equals one beautiful 18-inch block. I can't wait to make more. I'm busy, busy, busy! My goal for July is to finish this quilt top or at least have nine blocks sewn together. The sashing may have to wait until August. Wish me luck! 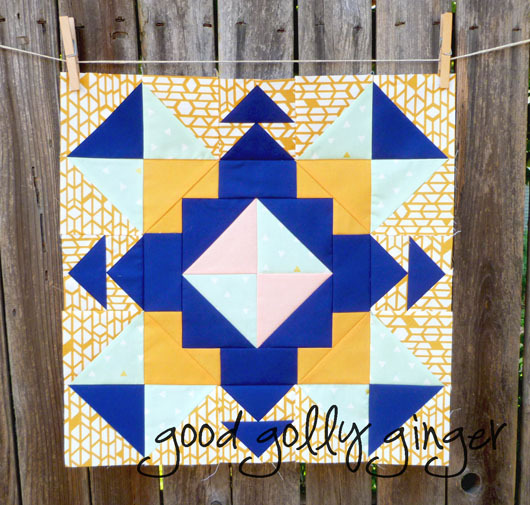 My goal for FAL Q3 is to complete this quilt! A beautiful design and lovely made block, Katie. Great fabric choices.... I love the contrast! Beautiful design and color placement in the block! I love the Arizona fabric line, it has been on my mind lately, and it's nice to get some inspiration from someone who has already starting using it! Great fabric combinations and pattern! I love this block. I think it's one of my favourite uses of arizona that I've seen so far. While I love the collection, I find (only from observation) that it doesn't always go together well. But that's my very uneducated opinion! This is going to look amazing! This is beautiful, I love the feel of this, it goes perfectly with the feel of the collection! This is a very striking block. Hope you find your sewing time in July. Such a pretty design! You must share the "how to" with us some day!